I should have been partying really hard last night at a friend’s 40th. Instead I was feeling mighty below par on the sofa under a blanket. Alongside Him. So we decided to watch the film they say marrieds shouldn’t watch. 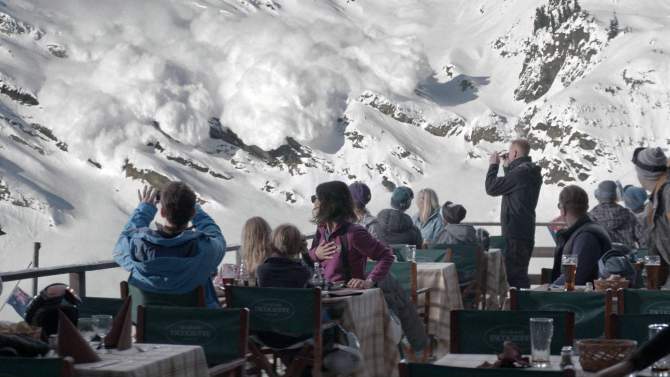 Not because it is anything other than a genius piece of screenplay but because Östlund’s Force Majeure is (apparently) a direct reflection of our marriage, family dynamics and probably includes the script of nay argument we might have had on a ski slope. 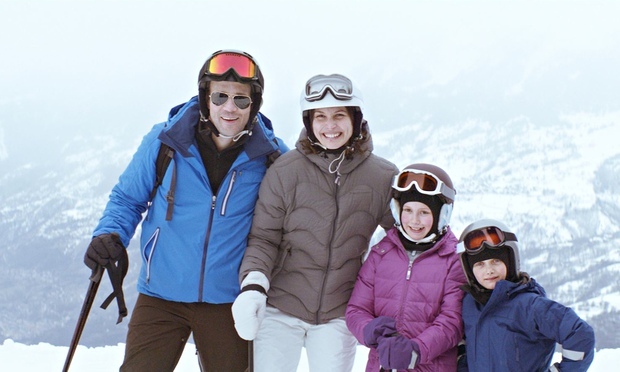 The film is the story of a middle-class family taking a holiday in the French Alps. However, don’t be fooled into thinking this ice-cold Swedish drama makes for light-hearted viewing. Tension is rife from the outset (not helped by an on-off Vivaldi soundtrack) as we sense something rather life-changing is about to happen (even when it isn’t). The catastrophe actually takes place when Tomas and Ebba are eating lunch at an open-air mountaintop restaurant with their children. The view is epic; as is the supposedly controlled avalanche. Tomas even takes out his phone to record the falling snow before it becomes evident that this tidal wave of white stuff is whooshing directly towards them at huge speed. This is the moment you need to really concentrate. Screams, terrified skiers and a complete white-out drives Ebba to (instinctively) grab her small children while her husband snatches his gloves and phone and legs it. And this act of cowardice, selfishness and self-protection over his family’s safety is one his wife simply can’t stomach. In fact, worse still, it festers and festers until it rots the holiday. How curious then that this film was quite so therapeutic to watch. He and I discussed how Tomas reacted. Not just at the moment of crisis (you never know exactly how you will respond) but afterwards and as his wife tells and re-tells the dramatic story. Even more curiously, I think I felt more sorry for pathetic Tomas than He did. Knowing that Force majeure means a legal concept which allows you to get out of a contractual obligation (an act of God that means you can’t be sued), I wondered afterwards if the unspoken contract binding our family together is simply nullified in a crisis. OR if this is the point that the contract is most valid? Either way, this is definitely one to watch. And, if you’ve already seen it, let me know what you think!